This program is designed for athletes graduating from Junior HP program aged 14 to 16 and those with previous biathlon training and racing experience in provincial level competitions. Athletes in Senior HP program are training an average of 4 days a week throughout the year and take an active part in club’s training camps. 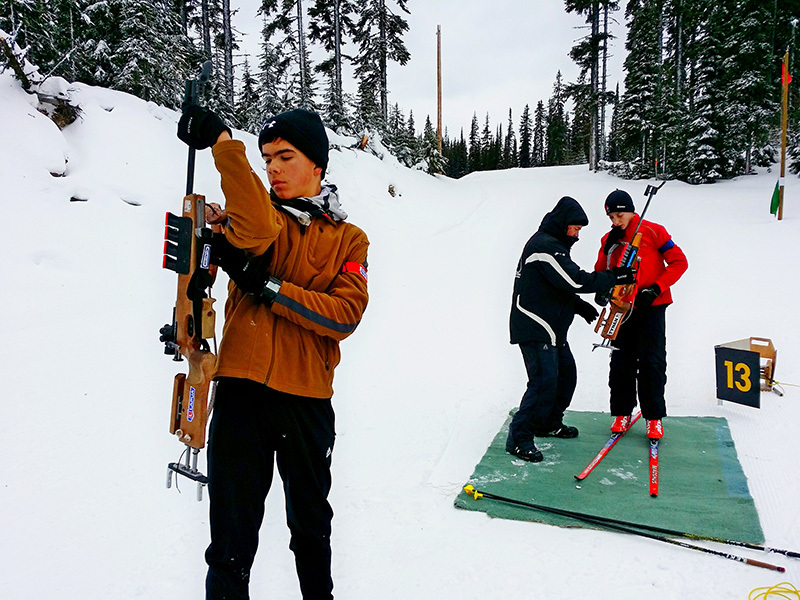 This group’s training is centered on specific skill development such as shooting standing and theory of the sport in both skiing technique and shooting. Senior HP athletes compete in Senior Boys/Girls categories of the Alberta’s Calforex Cup race series. The athletes at this level are also encouraged to compete in qualifying races for the Canadian National Championship. Athletes in this group are NOT eligible for club rifle rentals. The entry to this program is based on athlete/parent interview with the club’s selection committee upon online application submission as well as upon meeting performance criteria set by the Head Coach. Clothing to Participate in ALL weather conditions. Wearable Water Bottle for training. All biathletes must have a biathlon rifle. There are a number of club rifles available to new biathletes on a first come first served basis, rental is $250 for the first year. Athletes who intend to compete for several years in biathlon are encouraged to purchase their own rifle so that it may be adjusted to their particular requirements. A used biathlon rifle can usually be purchased for about $2,500-$3,500 while the new Anschutz Sprint Fortner biathlon rifle will cost just over $4,000. The athletes are responsible for the purchase of their own training equipment, including rifles, ammunition, skis, mountain bikes as well as membership fees for Biathlon Alberta (Provincial governing body for the sport of biathlon) and Alberta Bicycle Association. Annual ski pass and range user fee at the Canmore Nordic Centre. This is our “home base” and we must pay the fees in order to use the facilities.